"This is an easy chocolate pie." Prepare pudding according to package directions. Cover pudding with wax paper and allow to cool for 5 minutes. Pour pudding into pie shell and refrigerate until cool. Top with whipped topping before serving. Garnish with chocolate shavings. Very simple to prepare and it was devoured by my family. Used an Oreo chocolate crust instead of a pie crust and added the whipped cream. Topped with some crushed Oreos as a decorative touch. I made it for Thanksgiving and everyone ate the Chocolate Pie and left the Pumpkin Pie! It was very fast and easy to make! It will be put into my Favorites List! Yummy! 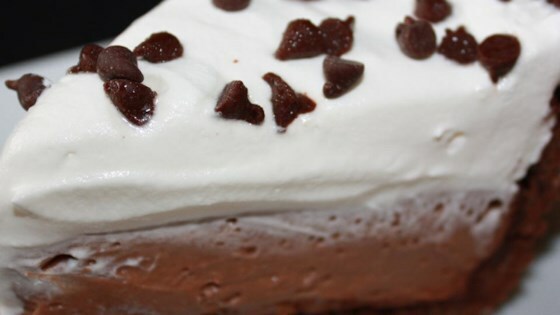 I have made chocolate pie like this since I was a little girl. The only difference is that I use the pudding that you cook. I've never been able to adjust to instant pudding!! I love how easy this is. I used an oreo cookie crust and I didn't even remember to put the cream on top. My mother loved it.